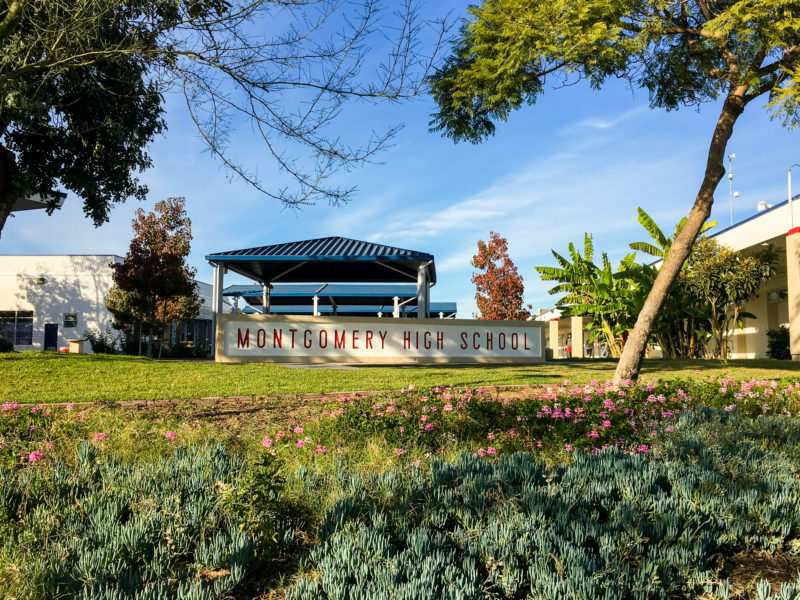 Officials at Montgomery High School ran an active shooter drill as cover so San Diego Police could arrest four students who allegedly committed serious crimes off campus. It appears to be a new and untested law enforcement strategy. San Diego police officers floated the unorthodox idea first: Hold an active shooter drill. Lock down your classrooms. Then let us come in and arrest four students. Two days later, on Halloween, officials at Montgomery High School in Otay Mesa carried out the ruse. While students and teachers went through the motions of pretending a shooter was on the campus trying to kill people, real police came in and took the four students into custody. Using such a drill as cover to carry out arrests appears to be a new and untested law enforcement strategy. Officials at the Sweetwater Union High School District say they wanted to accommodate police in making the arrests as safe and controlled as possible. Some juvenile justice advocates argue the students’ rights were curbed and school officials should not have lied about the nature of the drill. The students did not commit any crimes in or near the school, said Sweetwater spokesman Manny Rubio. But police believe the students were responsible for a string of serious crimes in other parts of the county. Police officials would not comment or say what crimes the youth were charged with. At least some of the students were associated with a local gang, said some parents familiar with the situation. They also had some connection to the football team, the parents said. It is not uncommon for police to approach school officials and ask to arrest a student for crimes that happened outside the school, Rubio said. He acknowledged, however, the request to do so under the cover of a drill was unique and had not previously occurred in Sweetwater to his knowledge. San Diego Unified School District officials likewise said they did not believe any similar tactics had ever been used in San Diego Unified. Indeed, police allowed the students, who were apparently considered dangerous, to remain in school and on the street for at least two days prior to their arrests. Police came to school officials with the idea for using the drill on a Monday. It was carried out two days later, on Wednesday, Oct. 31. “It sounds like this was done out of convenience,” Harris said. He pointed out three specific problems with the practice. For one, the students did not have any kind of representation, like a lawyer or a parent, at the school, Harris said. Had the students been arrested at home, their parents could have advised them and helped advocate for their rights. Rubio said officials had previously scheduled a drill for mid-November, but bumped it up when the San Diego Police Department made its request. The drills are required once per semester. Ultimately, the decision to move up the drill as cover for the arrests rested with Principal Thomas Gray, Rubio said. Police informed Gray that using the drill as cover would be the most unobtrusive and safe way to arrest the students, so Gray acquiesced. He declined to comment for this story. Other students were cleared from classrooms before the four students were arrested, Gray also wrote. Staff tried to make sure that no students were seen being arrested. But in one case, a class did witness an arrest. In a normal scenario, a student would be taken to the principal’s office and handcuffed behind closed doors. Typically in lockdown drills, students and teachers are first informed over the intercom to initiate a “secure classroom” drill. In this scenario, teachers lock the doors but keep teaching. The drill is escalated when an announcement goes out for classrooms to go into “lockdown.” At this point, teachers turn off the lights and students and teachers attempt to hide. Rubio, the district spokesman, said he was unsure at what point during the drill students were arrested.